New York, NY … On Wednesday, October 18, Trump’s anti-Muslim Travel Ban v. 3.0 is scheduled to go into effect. The revised ban which bars people from six majority Muslim countries (Iran, Libya, Syria, Yemen, Somalia, Chad) and North Korea and Venezuela from coming to the United States and delays all refugee entries. The last two countries replace Sudan and Iraq, which were part of the original travel ban, and added Chad. “Trump’s revised travel ban is a thinly veiled attempt to disguise the ban in the eyes of the court. But it is still an anti-Muslim ban and we’ll fight this one too. Trump’s ban threatens the lives of immigrants and refugees from all walks of life. It has a direct impact on the lives of LGBT people and tears our families apart.” said Glenn D. Magpantay, NQAPIA Executive Director. On the day after the Executive Orders were announced, January 27, chaos broke out in airports across the United States with travelers being stopped, held, turned back etc. NQAPIA received several urgent complaints and provided legal assistance to LGBT Muslim people and allies at airports who were caught up in Trump’s orders. NQAPIA’s brief illustrates the impact of the travel ban on the LGBT community. Homosexuality is criminalized in the counties subject to the ban. Many LGBT people in those countries are fleeing oppression due to their sexual orientation or gender identity. But, Trump’s travel ban prevents them from reaching safety and from escaping persecution and life-threatening conditions in their home countries or in refugee camps abroad. The brief also illustrates the impact on U.S. citizens and lawful permanent residents (LPRs) who have LGBT partners and family members abroad who are seeking refuge in the United States. Trump’s travel ban deprives U.S. citizens and LPRs of their constitutionally-protected right to maintaining familial relationships with their loved ones—whose safety is jeopardized by their sexual orientation or gender identity. mock checkpoints targeting white people to replicate the profiling that South Asians, Muslims, and people of color experience at airports and in government buildings. 300 people participated in the actions that unveiled the interlocking systems of Islamophobia, transphobia, xenophobia and anti-blackness. More information about the actions can be found at nqapia.org/queerazaadi. “Trump’s series of Muslim Bans are not about keeping us safe. For LGBTQ API communities, safety means eradicating borders for ALL of our families – given, chosen, and imagined. We will continue fight Trump’s Muslim Bans, anti-Trans bills, and all policies that criminalize our communities by building up our own power, strategy and resilience.” said Sasha W., NQAPIA Organizing Director. NQAPIA has also published the personal stories of LGBT Muslims and South Asian sharing their experiences of policing and profiling in writing at nqapia.org/redefinesecurity-stories and in video at nqapia.org/redefinesecurity-videos. The National Queer Asian Pacific Islander Alliance (NQAPIA) is a nationwide federation of LGBT Asian American, South Asian, Southeast Asian, and Pacific Islander (API) organizations. We seek to build the organizational capacity of local LGBT API groups, develop leadership, and expand collaborations to better challenges anti-LGBT bias and racism. Thanks for your support on ! It’s not too late to give! Donate at www.nqapia.org/donate. Thanks to #GivingTuesday, 52 people donated online for a total of $5,055! Thank you so much for your generous support. This means that we are more than halfway to our end-of-year goal! If you haven’t donated, will you please support our lesbian, gay, bisexual, and transgender (LGBTQ) Asian American, South Asian, Southeast Asian, and Pacific Islander (AAPI) community for 2017? With a variety of precautions to take before and after the inauguration, we are growing our attorney referral network. If you need help now, find an attorney here. If you’d like to volunteer to help, we are still accepting attorneys. We will host a convening of racial justice activists, tentatively in Washington, DC in May. We are excited to plan more with our federation members to have another provocative action like#15YearsLater. Four Regional Summits will provide growth, support, and leadership opportunities relevant to your area, and we bridge these experiences with our national work. We need your help to support each other with love and resources, to respond to hateful rhetoric, and to fight hard for our LGBTQ AAPI community. Will you help us raise $10,000? 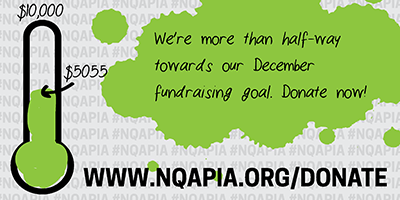 All donations to NQAPIA are tax-deductible! Donate online, or mail a check to NQAPIA at 233 5th Avenue, Suite 4A, New York, NY 10016. Thank you for your support of the LGBTQ AAPI community. We can’t do this without you.